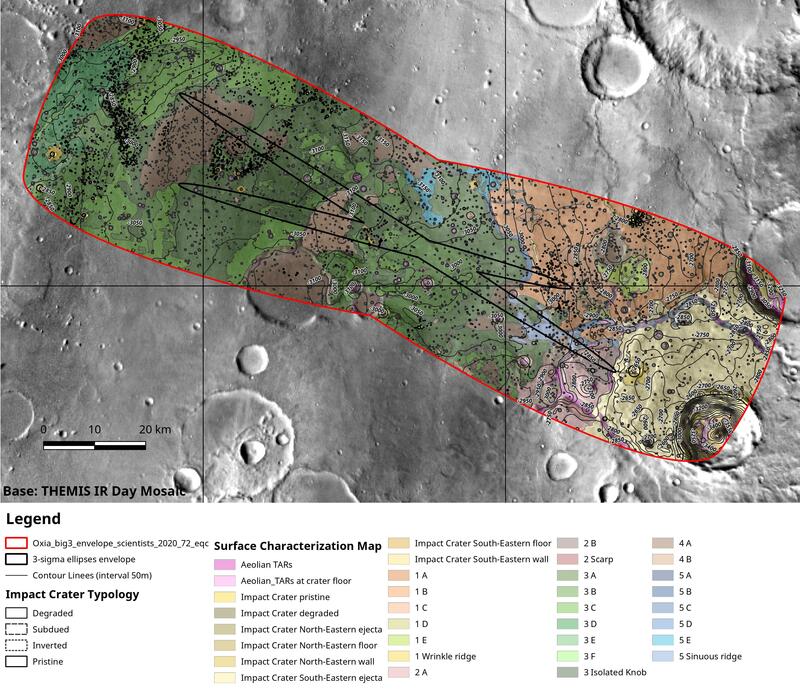 Last week the European Space Agency (ESA) announced the final chosen landing site for their 2020 ExoMars rover, a region called Oxia Planum. To understand better what they mean by this, we need to zoom out. 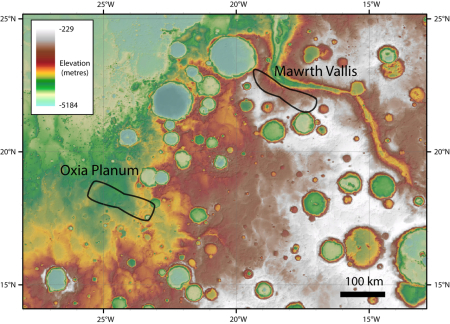 The overview map on the right shows the area in the above image, indicated by the white box, in context with Mars’s more well known geography. The red rectangles on the map are Mars Reconnaissance Orbiter (MRO) images. The two finalist candidate landing sites are easily spotted in the box, as blobs of red where many many images were taken. Once again, Oxia Planum is the blob in the lower left of the box. This location is east of Marineris Valles and the string of three giant volcanoes. 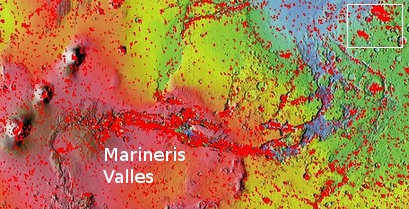 Mars’s largest volcano, Olympus Mons, is just off the map to the west. The landing site is in the drainage region coming down from these volcanoes. As I noted in my previous analysis of these two candidate landing sites, Mawrth Vallis is a far more spectacular site (further proven by the many more images that have been taken by MRO of it), while Oxia Planum is less risky. I predicted then that the ESA would pick the less risky site, and they have. 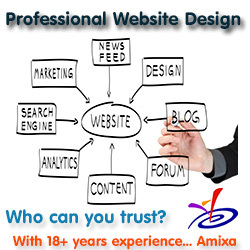 What makes this site very exciting, nonetheless, is its location. As they note in the quote above, it is close to the transition zone between the southern highlands and the low northern plains where some believe an intermittent ocean might have once existed. This is a region that has been found to have many shoreline-type features. The map outlines a boundary that encapsulates the range of possible landing ellipses, with some added margin. The colours represent the variety of surface terrains identified, including plains, channels, impact craters and wind-blown features, for example. It is not a geological map intended for scientific analysis, but rather a tool used to identify different surface textures and where potential hazards may lie. The central touchdown point is actually the high point in this region. To the west the land gently descends to that vast northern plain. The most interesting nearby features however are some meandering flow features, like rivers, to the east. These are also at lower elevations, and are also draining into that northern plain. What ExoMars 2020 will see will depend on where it actually lands within this ellipse, and where its science team decides to send it. According to this mission website, it will travel several kilometers during its mission, set to last 180 sols, about six months. This means that it will be capable of visiting only a small section of this ellipse, and what we will see will largely be determined by the landing point. What are the chances that their rover exceeds its projected lifetime? It will be really cool if we are all pleasantly surprised.